Just when I was thinking, “Man, I wish Google would either create a native iPad application or a universal iOS application for Google+” they did just that. Yesterday, Google released their highly anticipated Google+ universal iOS application which has been optimized for the iPad. It is available for free in the Apple App Store. Not only does it bring full display support, but you can now start and join Google+ Hangouts, use the Instant Upload feature, as well as other new features. After opening the application and logging in to my Google account, I was immediately impressed with the visuals. 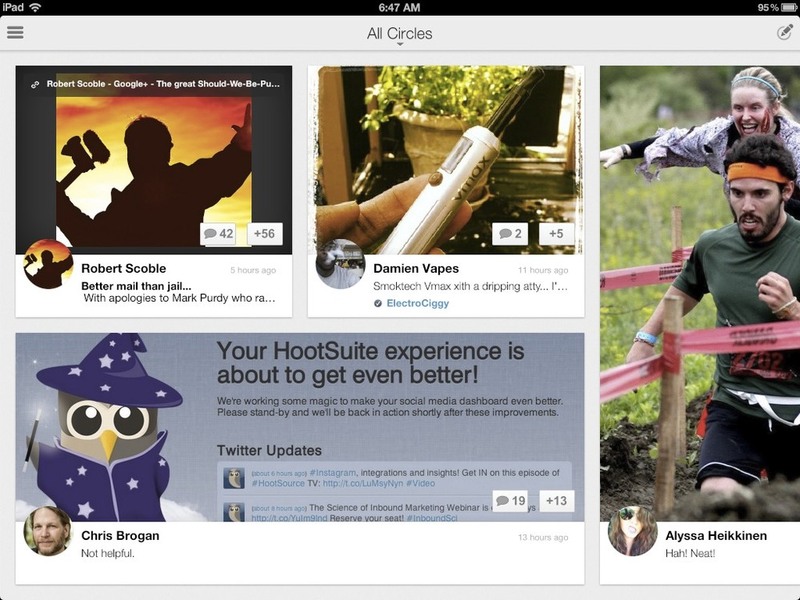 Images are crisp and the interface is extremely responsive. I haven’t had a chance to try it with the original iPad or iPad 2, but as for The New iPad they look very, very nice. This is how I expect applications to be designed. Animations are smooth and appealing without slowing down the system. The layout actually makes sense. For example, when browsing through the home screen, popular posts appear larger than non-popular posts when swiping through them. I’m definitely not a big Google fan, but it’s obvious they did their homework in this department. You can choose which circles display information by tapping at the top of the screen, and create new posts by tapping on the top-right of the screen. To refresh, swipe to the left. And to open additional menus, tap the menu button at the top-left, which will bring up the option to select Home, Profile, Hangout, Find People, and settings. Beneath that are notifications. Very clean. Very easy. Clicking on Profile allows you to, you may have guessed already, view your profile. However, it doesn’t allow you to do much else. You can see your details, but can’t change any of them. The only real actionable thing I’ve found available from here is the ability to share photos in Instant Upload and click on links that show up in your stream. Hangout is still hangout. You can start a hangout with up to nine other people by inviting specific individuals, circles, or by making it public. 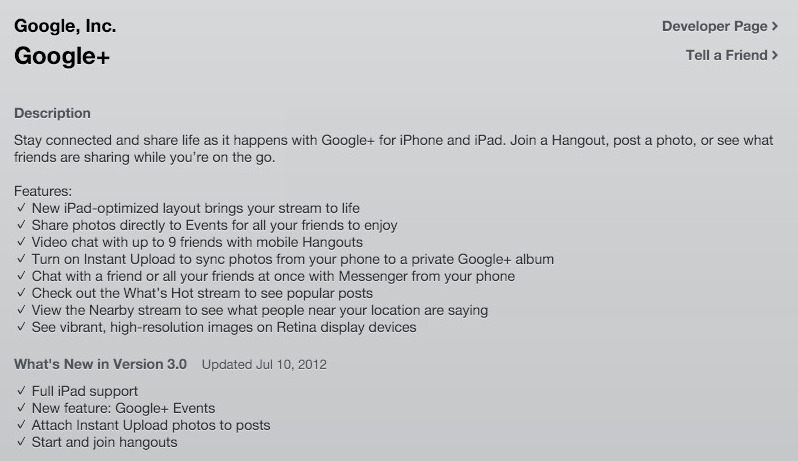 I’d love to see the option to view current and future public Google+ Hangout sessions. Although there are a lot of great things about the new Google+ applications, there are still a few things missing that I’d like to see implemented sooner rather than later. Circles - Really? Where is the Circles feature that lives in the iPhone version? I can create a new circle and select them when adding friends, but either I haven’t found the feature to see who has you in circles, and who you have in circles, or it doesn’t exist. Overall, I think it’s worth the download if you have an iPad. The features are compelling enough to warrant having, and the visuals are simply stunning. It’s not yet quite where I think it should be, but for a first attempt, I think the folks over in Mountain View did a pretty good job. Will it be a contender for the likes of Facebook? I don’t think so. What Google is doing very well, though, is merging social components into the threads of our daily lives. Whether you think that’s a good or bad thing (or somewhere in the gray area) I’ll leave up to you to decide. As they increase the competencies and ubiquity of collaborative features such as Hangouts, Google Docs, YouTube sharing, etc. I can see it becoming a very solid tool for creativity, meetings, and work. So that’s what I think. What do you think? 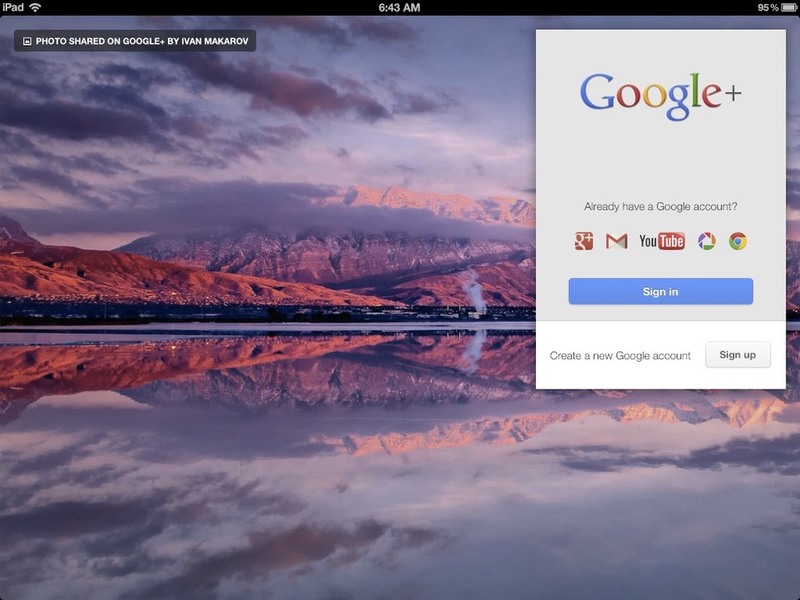 Have you played around with Google+ on iPad yet? What are your thoughts and initial impressions? If you like this post, sign up for updates.